with these adorable cutting files from Miss Kate's...but I think it totally works! represent the size I was looking for. To begin, cut desired double-sided patterned paper to 7"X12". With the paper laying length wise, score the paper at 2.75", 5.5", 8.25" and 11". Turn the paper; score at 4". cut the vertical score lines at 2.75", 5.5" and 8.25" just until the score line meets the horizontal score line. Fold and glue the final 1" flap down to create the box. edges of the box. Now you can attach your favorite decorations to the inside. 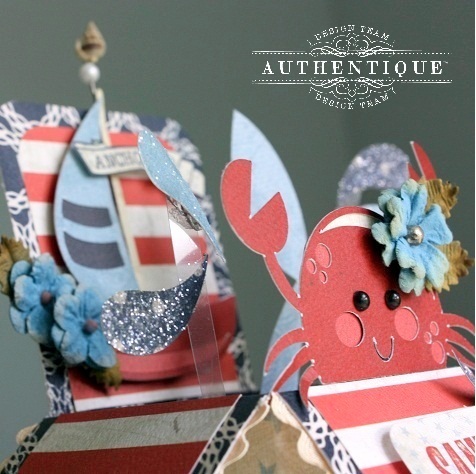 For my card, I used cutting files from Miss Kate Cuttables! 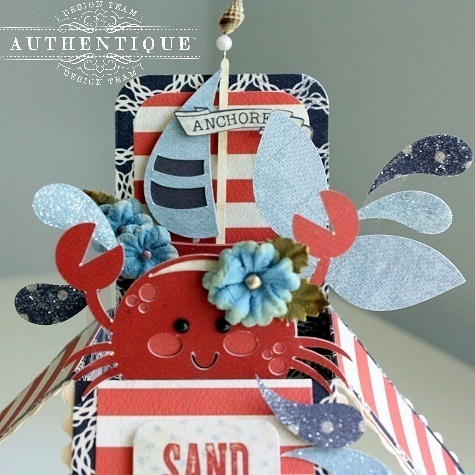 On the front we have an adorable crab which I embellished with a Petaloo flower. to a thin strip of clear overlay and then adhering to the back of the whale. The edges of the flaps were edged with some of the Petaloo Taupe ric rac trim. To the back, I added one of the Petaloo Sea Shell Pins to the top of the sailboat. The box can now be folded flat and inserted into an envelope for mailing! or baby shower...lots of ideas! Here is a list of products that I used; see the above for links to the cutting files. Both companies have prize packs up for grabs this week! Be sure to visit both blogs to find out more and enter to win...good luck! 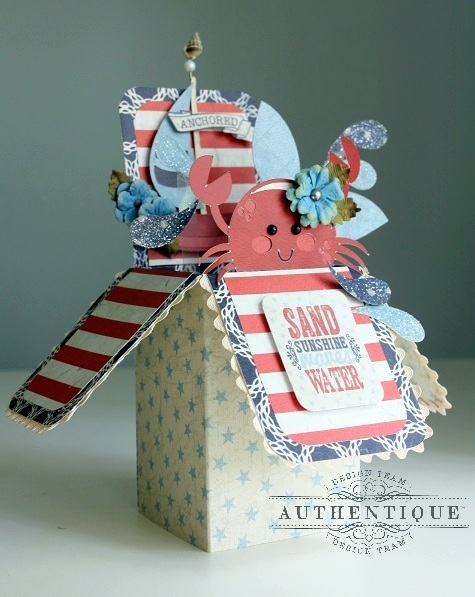 Awesome job on your cute box card! Great tutorial on the how to do it. I need to give one of these a try. I love the flower on the crab and whale tail with the sail boat floating by. Great way to add the extra splashes with the clear. Fabulous job!